Multiple companies are vying for my new security software, but when the men of Pentabyte turn their attention on me, it seems they want more than just my code. They're at the top of their game—intelligent, driven, wealthy—and they have me thinking maybe I want more, too. But everything I've worked for is on the line. Do I dare to mix business with pleasure when the stakes are this high? 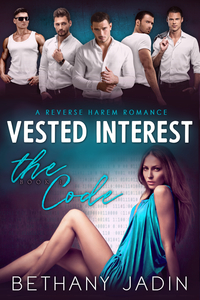 Vested Interest is book one of The Code, a reverse harem continuation series of five full-length novels with heart, humor, heat, and an action suspense storyline that gathers in intensity with each book. You'll find a strong woman and five intriguing men, each with their own quirks, wounds, and desires—but their focus is all on her.